WEStrans was founded in 1998 as a shipping company. In 2005-2007 we bought several trucks with trailers and since that time we have built our strong position in international transport. We work on direct orders from leading automotive companies. We deliver auto parts from their manufacturers based in Germany, France, the United Kingdom and the Benelux Union directly to car factory assembly lines located in Germany and the UK. If you drive a BMW, Mercedes, Volkswagen, Ford or Volvo, you are most likely driving a car whose parts we delivered. It’s our modest contribution to your comfort and safety. We are committed to delivering high quality services through our competent Staff. The modern fleet combined with many years of experience make us what you want us to be – a reliable, dependable and punctual partner for your transport needs. We have several MAN, Scania and Mercedes mega type (low deck) trucks and Koegel trailers. Almost all our fleet was manufactured in 2015-2017 in compliance with EURO 6 emissions standards. 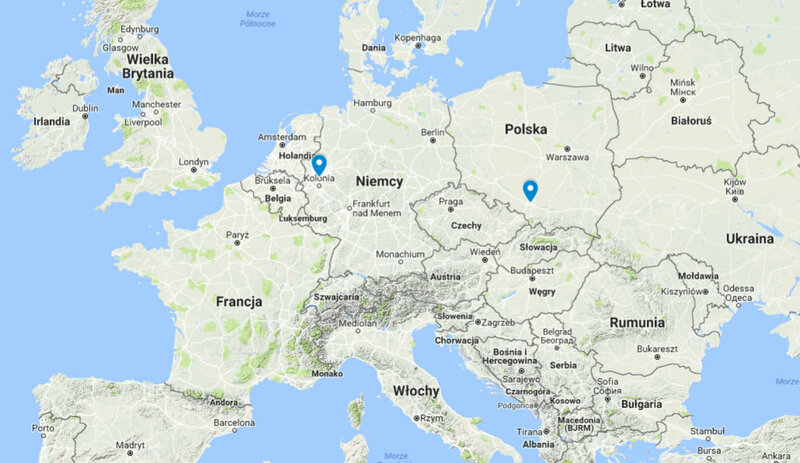 Our headquarters and primary fleet base are located in Chorzów, Poland, but our trucks operate on a daily basis from one of two regional hubs in North Rhine-Westphalia, Germany. Um dem Nutzer einen maximalen Komfort bei der Benutzung der Webseite zu ermöglichen werden durch diese Seite Cookies verwendet.